“But Sheryl!” You exclaim, “He’s broken! He’s washed up! He’ll never be that guy again!” That seems particularly true in light of the very, very bad track record of pitchers who had TOS surgery. And yet, newer studies have suggested that TOS survivors can get most, if not all, of their velocity and spin back. It just doesn’t happen all that often. And with the dim track record of thoracic outlet surgery patients rediscovering their prior form, we don’t really know how long the recovery period is. Some pitchers – especially younger ones like Jaime Garcia – break out after TOS surgery once they regain their strength. The best example is Mike Foltynewicz, who last year became the ace of the Atlanta staff. Harvey, of course, is no youngster. But he’s not doddering either. Harvey is still, amazingly, just 29 years old, which puts him on the younger end of the spectrum of pitchers who had the operation. But what’s really interesting is what we find when we do a deep dive into his numbers this Spring and the second half of 2018. Everything gets a pair of ticks harder over the course of the 2018 season. Most encouragingly, Harvey held his improved velocity into Spring 2019; he’s already throwing better than 95 miles per hour. Want another reason to be optimistic? How about this? 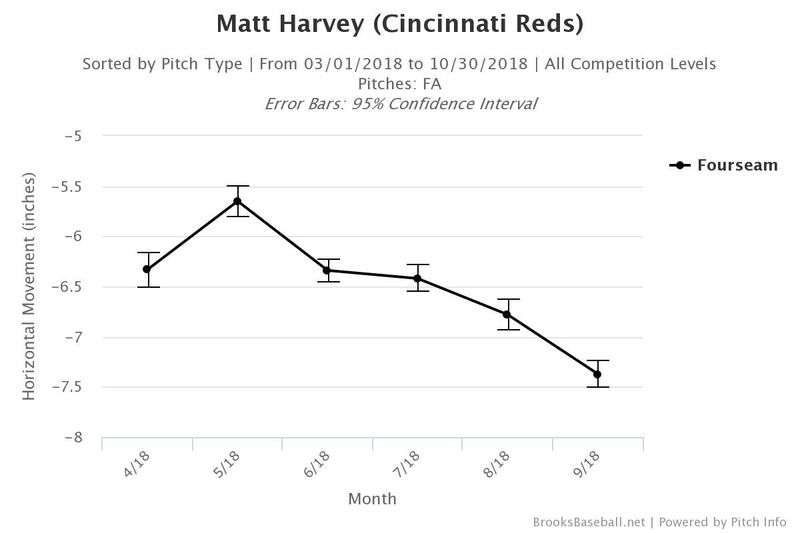 Over the course of 2018, hitters suddenly started swinging and missing at Harvey’s great curveball. A lot. And the more they swung and missed, the better Harvey did when he used the pitch. 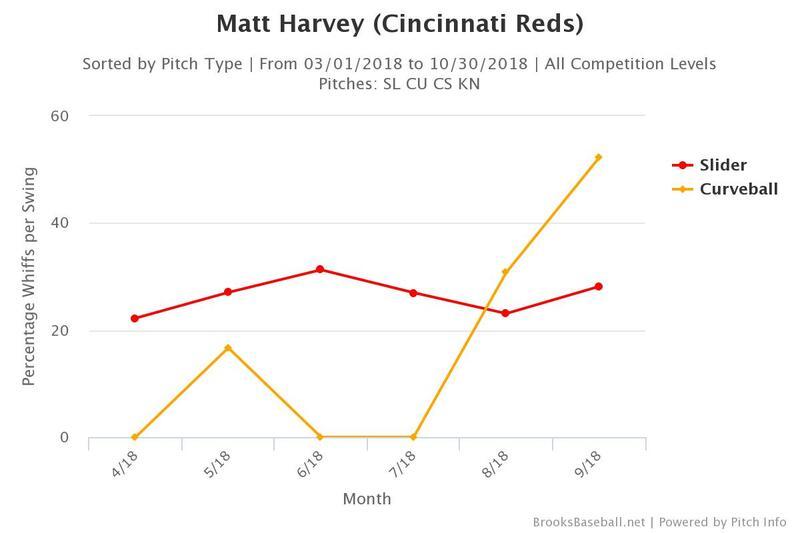 By August and September, Harvey’s curveball was a legitimate weapon. But it wasn’t his only weapon. 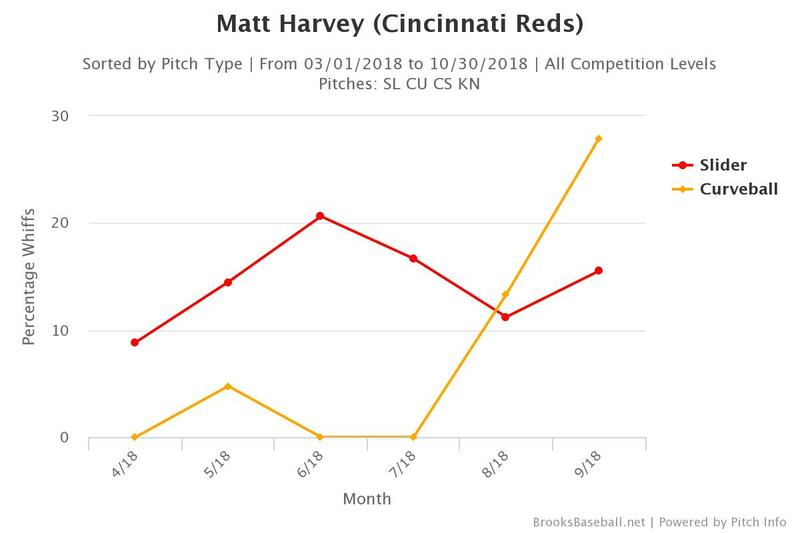 Around the same time, Harvey’s changeup also jumped in effectiveness. 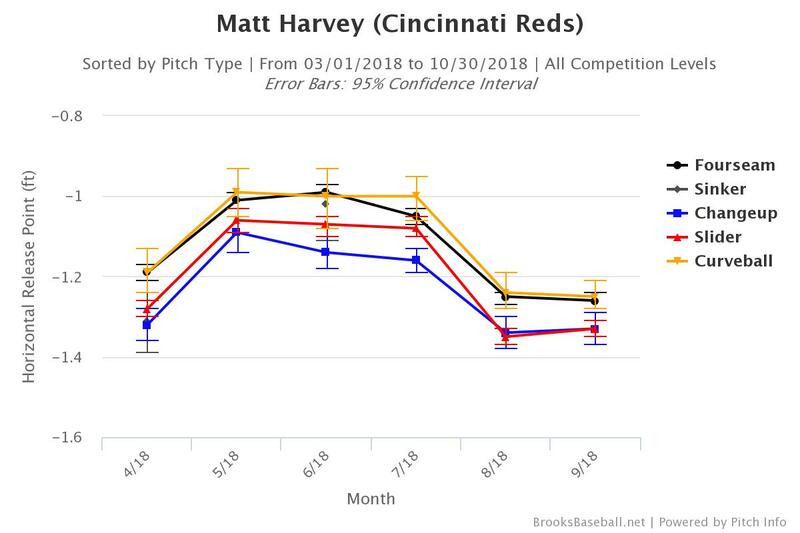 By the way, Harvey’s performance suddenly jumped in those last two months; across August and September in 2018, Harvey posted a 23.4% K% (9.0 K/9), 4.7 BB% (1.8 BB/9), 9.7% IFFB%, 3.89 FIP, and 3.62 xFIP. Yes, it’s a small sample, but the results were definitely there. 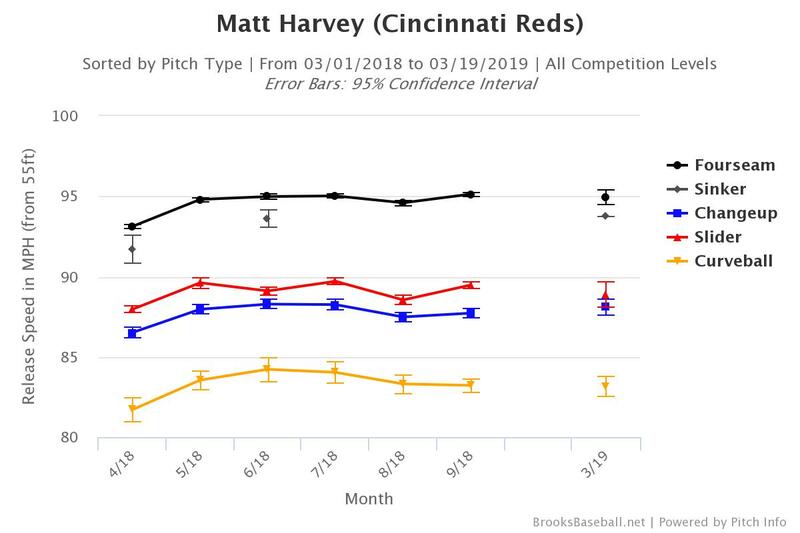 Harvey flashed a plus changeup and two good breaking balls – and if Harvey’s curveball improvements hold, it might be borderline elite. 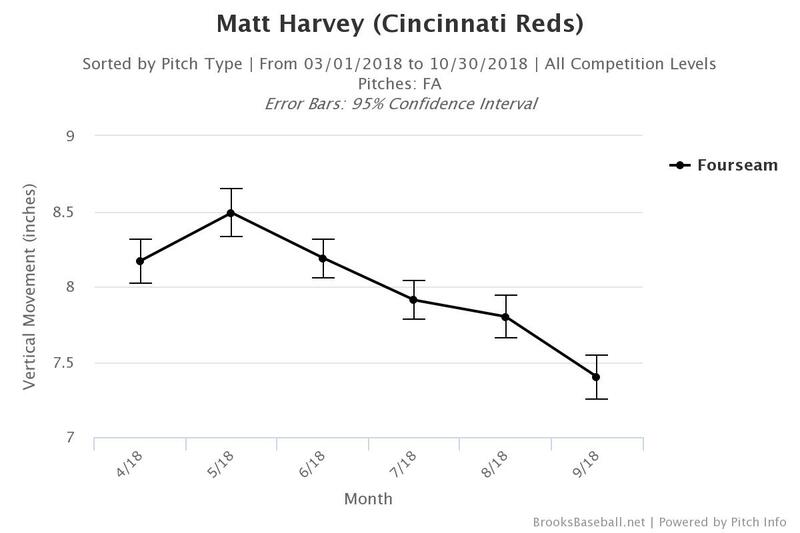 Harvey allowed just a .252 xwOBA on his slider in 2018, a .285 xwOBA on his changeup, and a .299 xwOBA on his curveball. But what of his fastball? The conventional wisdom was that Harvey’s once-vaunted fastball was so bad that hitters could tee off, essentially nullifying his secondary pitches before he could use them. But that’s not the whole story. As Harvey began deploying his curveball and changeup more in September, hitters began swinging and missing at his fastball, too. Harvey did this, counterintuitively, by reducing movement on his fastball, both horizontally and vertically. Now, I’m not saying that the Matt Harvey we saw in 2013 is about to burst onto the scene in Anaheim, though I doubt the Angels would complain if he did. 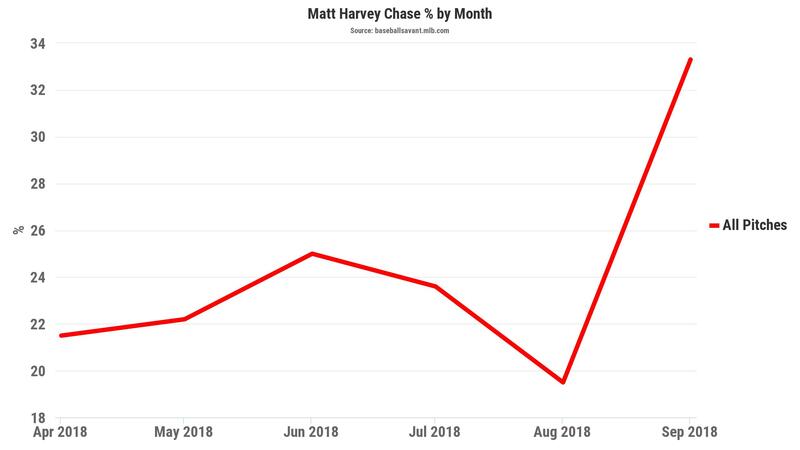 Instead, this profile – the Matt Harvey we saw in August and September of 2018 – is a valuable starting pitcher in his own right. The profile – good-to-elite breaking stuff with a straight, hard fastball – is essentially the same as another New York righty, Masahiro Tanaka. And while Harvey doesn’t have Tanaka’s splitter, he has a better curveball. We’ve already seen Harvey starting to throw his four-seam fastball less, in favor of a sinker and his breaking balls. That change in arsenal also corresponded with his uptick in performance. In other words, Harvey is starting to experiment, like Tanaka, with pitching backwards. And it worked! 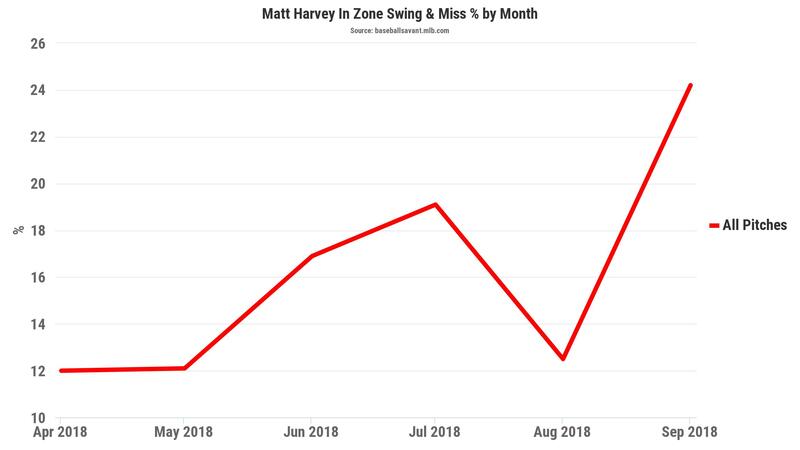 As hitters chased Harvey’s offerings more often, they became correspondingly less adept at causing damage in the zone. 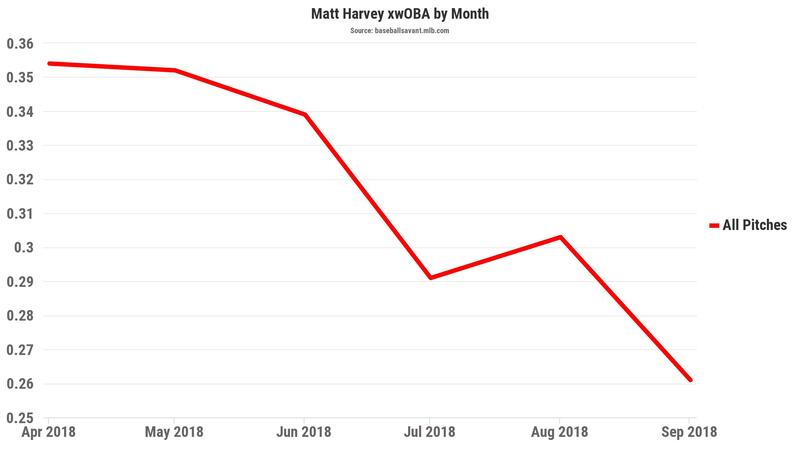 To put another way how Harvey transformed himself over the course of 2018, here’s his xwOBA allowed by month in 2018. How did this happen? 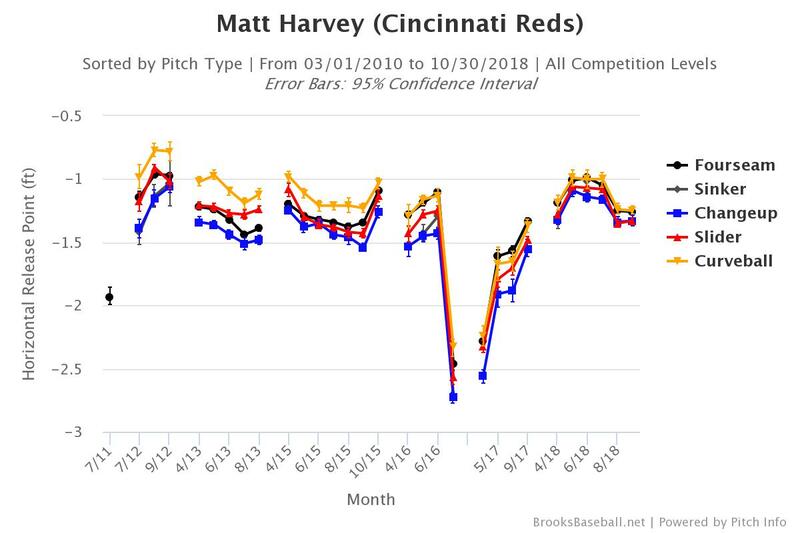 Harvey’s suddenly more effective, straighter fastball and better breaking balls were the result of a sudden change in release point after he joined the Reds. That release point, by the way, is almost identical to the one he used during his New York salad days in 2013. 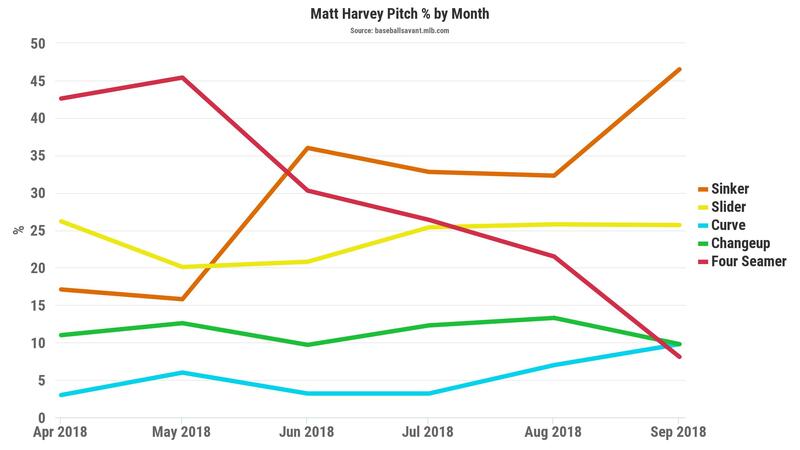 And Harvey’s strikeout, ground ball, and pop-up rates all spiked over the course of the season. I know this is a lot of information to throw at you, so let’s break this down. 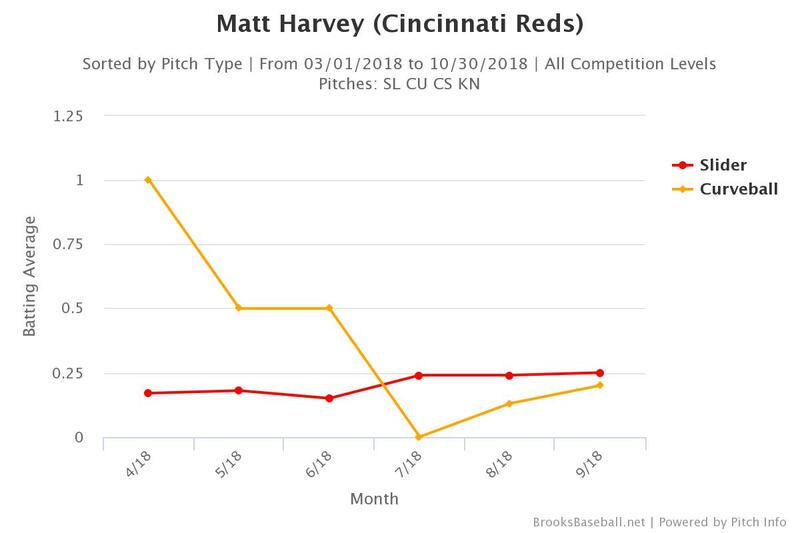 Over the course of 2018, Harvey regained the movement and effectiveness of his curveball and changeup. He never lost the effectiveness of his slider. He got more effectiveness on his fastball, by throwing it harder, straighter, and less, and added a sinker. And he did all of this by changing his release point back to where it was when he was the Metropolitans’ young ace. 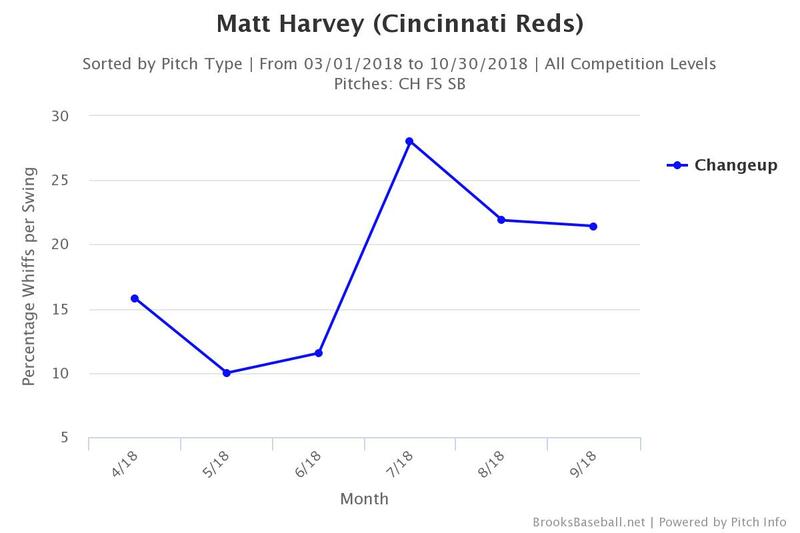 So what can we expect from Matt Harvey this year? 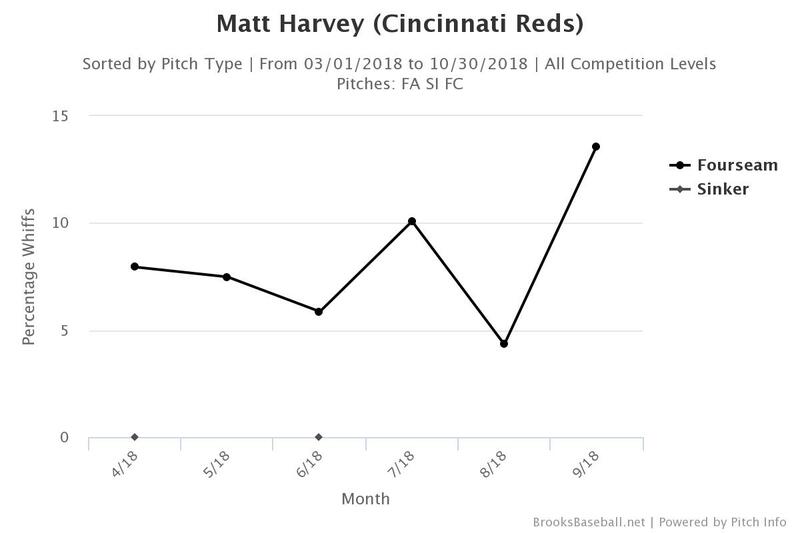 Harvey is making a concerted effort to pitch off of his curveball and changeup this year, and has heavily featured both offerings this Spring. That’s important, because those were a big part of his 2018 success. But there’s one other big part here. Harvey’s second half resurgence was masked by a brutal home run rate, one that wasn’t helped at all by the Great American Launching Pad he called home. In 2018, Cincinnati was the easiest park to homer in, beating out Coors Field and the new Yankee Stadium. Angels Stadium’s reputation as a pitcher’s park is overblown, but it was still seventh last year. That’s a sizable difference. Harvey will also be going on the road to Oakland and Houston instead of Milwaukee and Wrigley. So Matt Harvey is going to be fantasy-relevant this year. He might not throw 200 innings, but I expect he’ll approximate Masahiro Tanaka’s production over a full season: 150-175 innings, about a strikeout per inning, and an ERA and FIP between 3.75 and 4.00. If you keep him away from east coast ballparks on road trips, you might get even better production from him. Scoop him up now, because in a couple of months you won’t be able to. 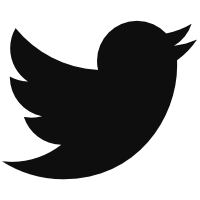 We hoped you liked reading Will the Dark Knight Rise in Southern California? by Sheryl Ring! Did a small portion of the same analysis you did, above, (who am I kidding, I just looked at his velocity and pitch mix) right after our Ottoneu draft. Was happy to pick him up for $1 as a flier. Because he is the starting pitcher the Angels deserve, but not the one they need right now.